TMJ stands for “temporomandibular joint,” which is the joint that connects your jawbone to your skull. Everyone has two TMJs, one on the right side of their face and one on the left side. When people say “I have TMJ,” they’re usually referring to pain in the muscles that control their jaw movement and/or their jaw joint. Botox is relevant to pain in the muscles, but not the joint itself. You probably learned through exercise classes that whenever you work out a muscle, that muscle gets sore and requires a certain period of time to recover. Your jaw muscles are no different. If you clench and grind on a daily basis, your jaw muscles never get the recovery period they need, so you can end up experiencing pain and muscle soreness or tenderness. 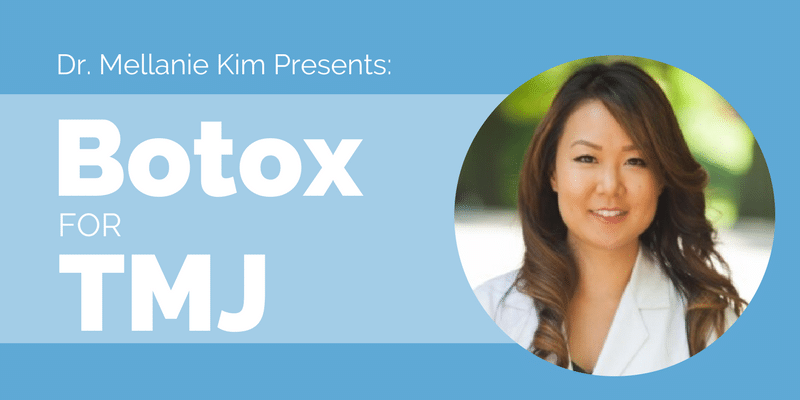 How can Botox Help TMJ and Jaw Pain? Botox is one brand of injection containing a neuromodulator called botulinum toxin, which helps relax muscles. When applied to the muscles that control jaw movement, botulinum toxin can help these muscles get the recovery time that they need. The actual neuromodulator I use has the same active ingredient as Botox but is called Xeomin. Xeomin is the purest form of botulinum toxin available and doesn’t have any of the bacterial proteins that Botox does. There have been issues with some people developing antibodies to these proteins. I’ll often initially refer to the treatment as “Botox” because that’s what people are familiar with, but I like to be transparent about what solution I use. If you are experiencing jaw soreness or tenderness from clenching and/or grinding, you are a candidate for this treatment. People who have limited opening due to tight muscles and people with orofacial pain, including headaches from overactive muscles are also candidates. Neuromodulators like Botox only help with pain stemming from the muscles that control jaw movement. They do not help with pain in the joint itself, so the extent to which Botox will relieve your pain depends on what is causing the symptoms. To be a good candidate for the treatment you cannot be pregnant or breastfeeding, and you cannot have any neurologic diseases such as Multiple Sclerosis, ALS, and Parkinson’s Disease. The neuromodulator injections take less than five minutes but your appointment will be about 30 minutes so that I can prepare the solution, evaluate your muscles and go over pre- and post-treatment instructions.You will receive four injections in total – one in your right temple, one in your left temple, one in your right jaw muscle, and one in your left jaw muscle. I will palpate the muscles and mark the injection sites before the injections. The total amount of the neuromodulator you will receive is 50 units. The injections are given using a very thin needle – the same size as diabetic needles used to prick a finger. The injections are virtually painless, but some people feel a slight burning sensation. The neuromodulator takes effect in 2-10 days and last 5-6 months. Since the minimum dental wellness recall is 6 months, we can combine your neuromodulator injections with your dental wellness visit to save you a trip! Please avoid anti-inflammatory and blood thinning medications two weeks before the injections. Using anti-inflammatory or blood thinning medications won’t diminish the effects of the neuromodulator; however, they may increase bruising at the injection sites. After the injections, please don’t touch the injection sites for 3-4 hours because you don’t want to push the neuromodulator into a different site accidentally. Also, please refrain from any activity that may cause you to sweat, and avoid the sun and heat for 3-4 hours. The neuromodulator is heat sensitive and will break down before it has a chance to take effect. Also, do some jaw exercises after the injections. You can snack on something hard and crunchy like carrots or nuts. Using your muscles after the injections will help the neuromodulator bind to the receptors to take effect. If you’re interested in meeting with Dr. Kim to discuss how treatment might help your TMJ, give us a call or send us an email and we’ll be happy to answer your questions and set up a consultation.